In 2012 the operation of the library in the North Yorkshire village of Great Ayton was taken over by the community, following withdrawal of funding by the county council. 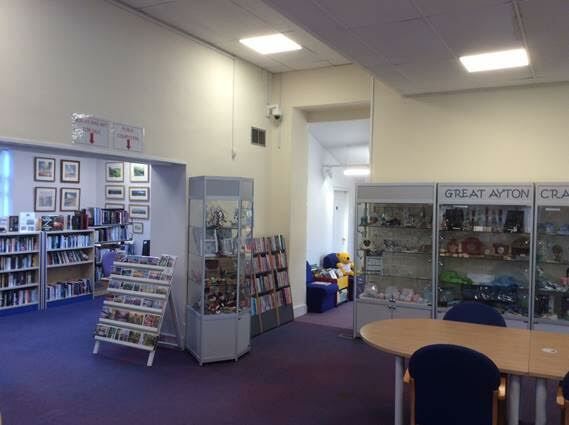 It was one of the first libraries in the county to be run by volunteers, and is now in its seventh year of community ownership as The Great Ayton Discovery Centre. This has only been possible through a partnership between volunteers from the village, the Great Ayton Parish Council (which provides financial support) and North Yorkshire County Council (which continues to provide the library service and IT facilities). Over the past 6 years the centre has expanded its opening hours and the services offered, and is now a highly-valued and well-used asset to the village. Many visitors come to Great Ayton, for its wide range of shops and small businesses, its connection with Captain James Cook, and its attractive location on the edge of the North York Moors National Park. This makes the provision of tourist information in the village particularly important. Previously however, the tourist information point was located in a fairly obscure place making it difficult to find. There were also increasing difficulties in finding enough volunteers to keep the service open, which resulted in a decision to close the tourist information point in 2018. It was agreed to bring the tourist information service into the discovery centre building, but to do this more space was needed. An extension was designed by architects PPIY Ltd of York, who had already worked on the adjacent Captain Cook Schoolroom Museum. We made a successful application to the EU LEADER fund, which fortunately had a section devoted to encouraging rural tourism, and this has given us 80% of the building costs. Because we have been able to generate a surplus over our running costs each year, we have been able to cover the remaining 20% ourselves (just about). Local builders Simpson and Hill have carried out the work, and we are all delighted with the results. Everyone has been truly surprised by the amount of additional space that has been generated, seemingly much more than the ground area on which it is built! Not only do we have more library space, but also a spacious store room. There has been much debate about how best to use the extra space. It was agreed that it would be better to integrate tourist information services into the normal operation of the centre, and to locate tourist literature and displays within the main library space. The old children’s library is now used for second-hand books and local artists’ works (these sales produce a significant income) and to house the computers. The children’s library is now partly in the new space and partly in an adjacent part of the main library. We are all delighted with the opportunity given by the LEADER Fund to give a ‘new look’ to the centre and to yet again improve our facilities. 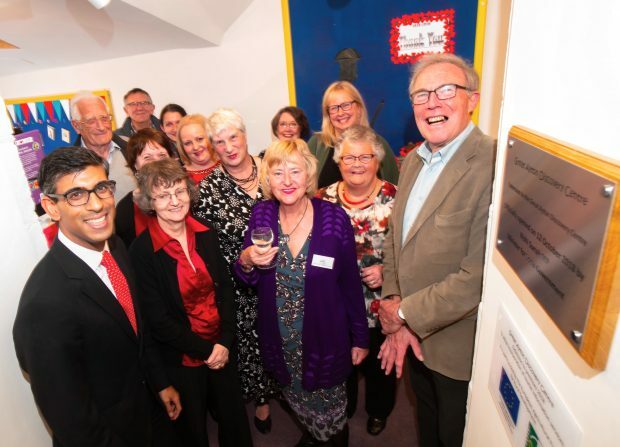 The extension was officially opened by Rishi Sunak MP, Minister for Local Government, on Friday 12 October. The official opening, with members of the Great Ayton team and Rishi Sunak MP, Minister for Local Government (left). Photo credit: Great Ayton Discovery centre. Since then, it has been awarded best community project in North Yorkshire council’s annual community awards. These awards celebrate and showcase voluntary work by individuals and organisations that make their neighbourhoods better places to live and help North Yorkshire County Council to deliver critical services, such as providing social networks that reduce isolation and enable people to live independently for longer. The judging panel, includes representatives from the county council, volunteer organisations and young people. This year, there were 66 nominations for 64 groups and individuals. To keep up to date with activities in the Great Ayton Discovery Centre, follow them on facebook.